Oudin Lab Holiday Party was a success! Skating on Frog Pond in Downtown Boston, hot chocolate and dinner! Madeleine serves as panelist at the MIT Path of Professorship Workshop for women interested in academia. She shared her experience with negotiating an academic job offer. Andrew and Will present their work at the Annual BME department retreat. Great to see all the progress made over the last 10 months! Madeleine gives seminar at Northeastern University in the Biology department. Great day hearing about the research at NEU and starting new collaborations. Madeleine attends the BMES Annual Meeting in Atlanta where she chaired 2 sessions on cancer cell migration and the role of the tumor microenvironment. Justinne Guarin, 1st year BME PhD student, officially joins the Oudin Lab. Welcome Justinne!! Welcome to our newest lab member and first post-doctoral researcher Samantha Payne. Sam just completed her PhD at the University of Toronto in Professor Molly Shoichet's lab. Sam will be working on an exciting new project in collaboration with Professor Mike Levin's lab in the Biology Department. The Oudin lab is participating in the Boston American Cancer Society Making Strides Against Breast Cancer walk on September 30th. Making Strides walks raise awareness and money to help save lives from breast cancer by funding research just like ours. Please donate to our team, 'Raiders against Recurrence'. Thanks to our fantastic summer undergraduate students Annika, Kelly, Lily, Claire and Gabrielle for their work in the lab this summer and their contributions to our research. 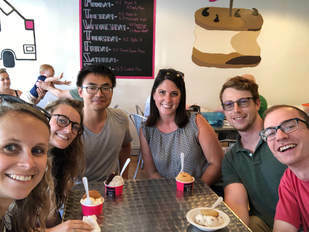 ​Thanks to Tufts Summer Scholars, Laidlaw Scholars and NSF for funding them! Welcome to Kelly Ward, a high school student at Reading High School, who will be working the lab over the summer as part of the TUBERs program here at Tufts. 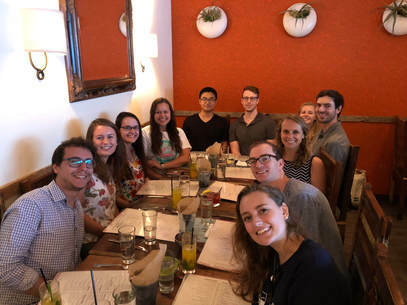 Madeleine attended the Signaling by Adhesion Receptors Gordon Research Conference in Biddeford, Maine where she chaired a session on 'Evolving Concepts in Adhesion Signaling and Cancer Progression. Welcome to Daniel Worstell, MD-PhD student from Tufts Medical School, who is starting his 1st rotation in the Oudin Lab! Congratulations to Will Le, 1st year BME PhD student, who successfully passed his qualifying exam! Welcome to Annika Gallandt, NSF REU student here at Tufts for the summer. Annika will be working in collaboration with Professor Georgakoudi's lab. 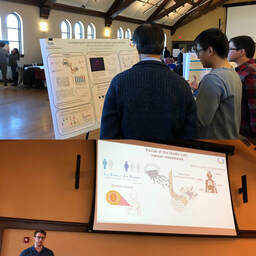 We hosted the first SEC Connections social hour at Tufts to bring together all the labs that work in our interdisciplinary building. The goal is to get to know our neighbors and promote collaborations! Thanks to those who came! CMDB Rotation student Jackson Fatherree is joining the Oudin lab! Welcome Jackson! Congratulations to Claire Dunn who has been named a Laidlaw Scholar here at Tufts! Congratulations to Lily Hayes who has been named a Tufts Summer Scholar! Lily will be working in the lab this summer on her project! Madeleine featured on the Tufts Now website. See here for more details. 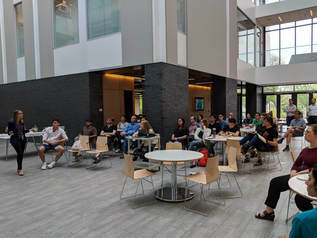 The Oudin Lab receives its funds funding as an independent lab. Thanks to the Tufts Committee on Faculty Research Awards for supporting the lab! Congratulations to Will Le for his acceptance to the CSHL Bioinformatics for Cancer Genomics Course. Happy New Year! The Oudin lab is officially open! Madeleine is appointed a member of the Sackler School of Graduate Biomedical Sciences Cell, Molecular and Developmental Biology graduate program at the Medical School. We look forward to interacting with the community on the Boston Campus!